Need help deciding where to start? You might be interested in my premium beginner guitar course which guides you through the entire process, step-by-step. 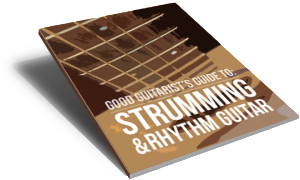 This eBook will help you build a solid foundation for rhythm guitar playing. Topics covered include: the 10 most basic chord shapes, chord switching tips, strumming from the ground up, using a capo to change the key of songs and a whole bunch more. These guitar chords for beginners are all it takes to play thousands of songs! 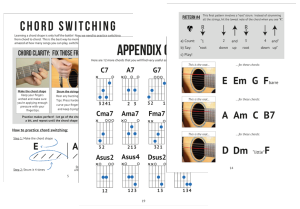 This is the fastest way to learn guitar chords. Focus on switching between just 2 chords at a time and be amazed at how soon you will be playing your favourite songs! 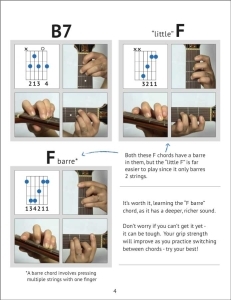 For many just starting to play guitar, strumming patterns can be a major challenge. Our unique visual method will guide you through some of the most common strumming patterns. When first learning guitar, songs for beginners are a must. These 10 chord progressions are found in thousands upon thousands of songs.